motat nəgəšt ənta hanaṣat hagara. The queen who built the city died. motu nəguš wa-nəgəšt əlla hanaṣu hagara. The king and queen who built the city died. You’ll notice that the masculine singular relative pronoun is written as a proclitic. It is used frequently like a preposition marking a genitive relationship, especially in cases where a construct cannot be made due to an adjective, suffix or proper names. The holy name of our prophet is John. They chased out of the Galilee of the Gentiles. He was born in the Bethlehem of Judah. 25.2: Similar to Arabic, when the relative pronoun marks a direct object, the verb (usually) takes on a resumptive pronoun. The same is true for when a relative pronoun is in a prepositional relationship i.e. whose, to whom, of which etc. The prophet whom they killed prophesied in my city. The woman whom he saw died. kāhnāt əlla səmomu qədmakəmu həyya wə’ətu. The priests whose names are before you are here. səma hagar zahanaṣu wastetā haykalomu iyarusālem yə’əti. The name of the city in which they built their temple is Jerusalem. 25.3: Relative clauses frequently appear as nominal units. The-one –who-killed (i.e. the killer) suffered. səma ənta sebbeḥəwwā ardāmis yə’əti. The name of the-one-whom they-worshipped-her (i.e. their goddess) is Artemis. They persecuted the-ones-who-lived (i.e. the locals) in the land. 25.4: Relative pronouns can also function as absolute nouns on their own and form the first part of a construct. They saw she-of John (i.e. John’s wife) in her house. They-of demons (i.e. the possessed) came to the church. 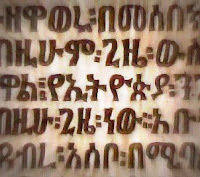 25.5: The relative pronoun of time is “አመ” (ama) i.e. “when” in the non-interrogative sense. It can appear as a preposition, a conjunction or a relative adverb. The relative pronoun of place is “ኀበ” (xaba) i.e. “where” in the non-interrogative sense. ama bo’əkəmu beta xaba nabara irakabkəməwwo? When you entered the house where he lived, you did not find him? gʷayyat əm-xaba deganəwwā wa-roṣat əska ama balḥakəwwā. She fled from where the persecuted her and she ran until the-time-when I saved her. ze-makān yə’əti xaba maharna tomā wāngel za-əgzi’əna ama hallawna daqq. This is the location where Thomas taught us the gospel of our Lord when we were children.